Numerical simulations are the core technique in forecasting the weather. The simulation calculates a weather forecast by use of an atmospheric model, which is implemented on a computer. The model itself can be partitioned into various complexity levels, and these can be associated with respective validation concepts. The proper design and implementation of the ‘dynamical core’ (i.e., partial differential equations and their numerical solver) is tested via comparison to idealized test cases. In a subsequent development step, ‘parameterizations’ are added, and then the simulation is considered a serious attempt to forecast the weather. The quality of the forecast is estimated by the retrospective comparison between simulation output and observed weather. In addition, a day-specific estimate of forecast uncertainty is derived via ‘ensemble forecasting’ on a routine basis. We thank Felix Fundel and Ulrich Damrath (DWD) for delivering several verification plots. 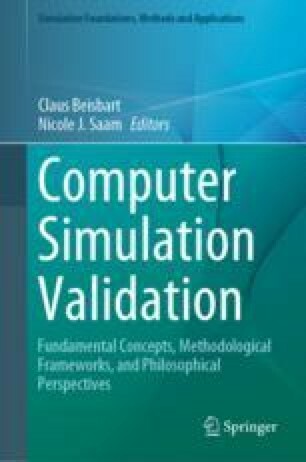 We also thank Nicole J. Saam and Claus Beisbart for inviting Susanne Theis to the Symposium ‘How to Build Trust in Computer Simulations’ (2015), funded by VolkswagenStiftung. DWD (2016). Deutscher Wetterdienst: Jahresbericht 2016. Deutscher Wetterdienst, Offenbach, Germany. http://www.dwd.de.